A 100% biodegradable seed bomb to spread the love! Filled with forget-me-not seeds, a wildflower known for its masses of tiny vibrant blue flowers. Forget-me-nots are symbolic of faithfulness and enduring love. Full instructions are included. 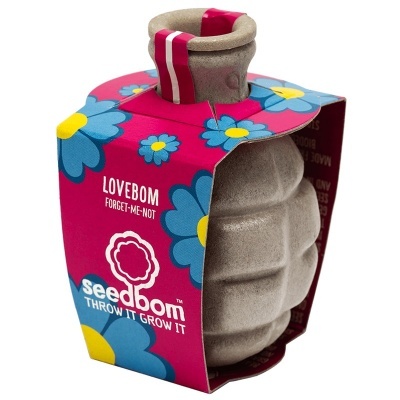 A 100% biodegradable seed bomb to spread the love! Shaped like a grenade and filled with forget-me-not seeds, a wildflower known for its masses of tiny vibrant blue flowers. Forget-me-nots are symbolic of faithfulness and enduring love.